As we wave goodbye to summer, it’s time to cast our minds to the wonderful autumn months ahead that bring a mix of beautiful colours with falling leaves and colder weather. Rather than dwelling on the change of weather set to come, we are embracing autumn by donning our woollies and exploring the best that County Down has to offer this season. Take a look at some of our favourite local spots and fun activities which are located just a stone’s throw from a cosy weekend staycation at Dufferin Coaching Inn. You could easily spend a full day in Castlewellan Forest Park, located a short drive from Dufferin Coaching Inn. The Forest Park spans over 450 hectares of land just north of the Mourne Mountains and boasts a stunning Victorian Castle, a play park and a range of different cycling and walking trails. Little ones of all ages can explore the green mountain bike trail around the lake, while the blue trail is more suited for those looking to enjoy a bit more bumpy, off-road fun! 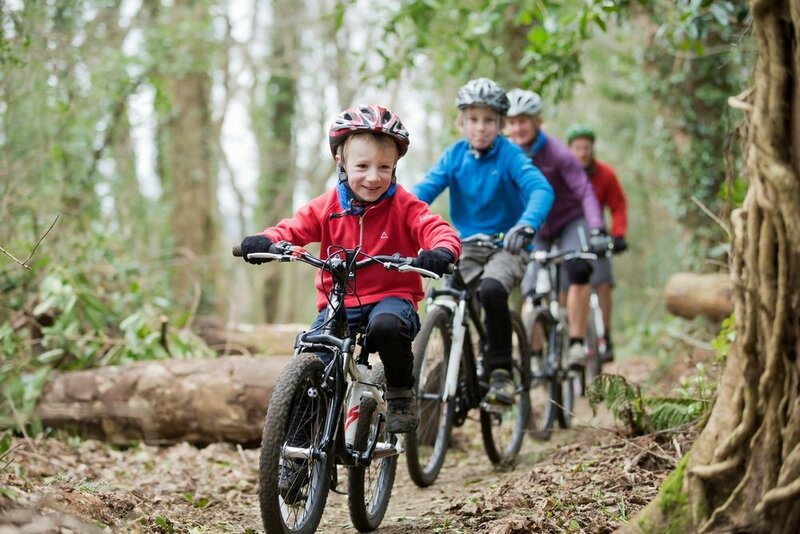 Bike hire is available from Life Adventure Centre. The Market on the Square takes place on the first Saturday of the month between July and December at the recently refurbished Portaferry Market House. The Market is the perfect weekend treat for the entire family, offering a chance to celebrate the wonderful range of artisan food and craft producers in the area. Visitors to the market can also take part in a 1.5 hour guided walking tour of Portaferry to learn more about this quaint village by the Lough. Upcoming tours take place on Saturday 6th October, Saturday 3rd November and Saturday 1st December, from 2.30pm. Book online or telephone 07763898074. Also known as ‘one of nature’s greatest migration journeys’, the Big Brent event returns to Castle Espie Friday 5th and Saturday 6th October, marking the return of 25,000 Brent geese to Strangford Lough who have travelled an incredible 3,000km from the Arctic. With a range of workshops, expert talks, wildlife walks and overall family fun, the weekend is definitely one to mark on the calendar. Parents can even sign the little ones up for the Junior Bird Watch Safari, perfect for young explorers. Visit here for more information. With Halloween fast-approaching, now is a great time to slot in some frightful and spook-tacular activities. For a frightening walking tour with ghoulish features, the Halloween walking tour of Newtownards is a popular choice. This tour also provides a great opportunity to bring out your most terrifying Halloween costumes to get in the spirit of All Hallows’ Eve. Tours depart from the Ards Arts Centre on Thursday 25th October from 7.30pm onwards. Following scary shenanigans in Newtownards, Rowallane Garden is the perfect spot for some spooky sightings and activities. With the ‘Ghost and Gourds Spooktacular running from Saturday 20th – Sunday 21st October, you can take your little monsters down the ‘Tree Terror Trail’ to get a glimpse of sinister characters from Premier Circus along with freaky face painting and the chance to test your pumpkin carving skills. The ‘Pumpkinfest’ offers over 2,000 pumpkins ready for carving, mysteries and clues on the Scarecrow trail, artisan food in the stable yard, and the chance to put your creativity to the test in the scarecrow competition. ‘Poison Chocolate Apple Dunking’ will also take place from Sunday 28th October – Sunday 4th November, where you can simple pop into the café and enjoy a spooky Halloween treat by dunking apples into delicious molten chocolate. Whichever activity tickles your fancy, you can be sure to enjoy an evening of unwinding and relaxation at Dufferin. For particularly busy days in the chilly outdoors we recommend warming right up with a delicious bowl of chowder and a tipple of hot whiskey at our neighbours, The Dufferin Arms who host weekly Traditional Irish, Folk & Bluegrass music sessions every Saturday, before tucking in for a cosy night’s sleep in one of our beautifully decorated rooms.